A bird’s-eye view above Little Puddle Pond allows a peek into Nellie and Willie’s world. There they can be found on opposite ends of the pond as far apart from each other as possible. Nellie and Willie spend each day on guard to protect their territory and do not hesitate to ruffle each other’s feathers. One day, Nellie and Willie must make a decision. Their friend, Bruce the Goose, is in a sticky situation and needs help. 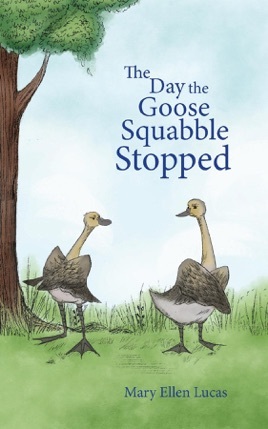 Can Nellie and Willie set aside their differences to help Bruce the Goose? What ensues is a brilliant rescue plan which leads to a startling realization as Nellie and Willie come to recognize they are more alike than they knew. Thus, begins a friendship between Nellie and Willie and how they learn to share Little Puddle Pond.